The Asia Cup 2018 got underway with a one-sided encounter between Sri Lanka and Bangladesh which the latter won comprehensively by 137 runs on the back of a century from veteran Mushfiqur Rahim. Before the start of the much-awaited Asia Cup 2018, all the captains of the six teams had indulged in a customary press meet on the eve of trophy unveiling. 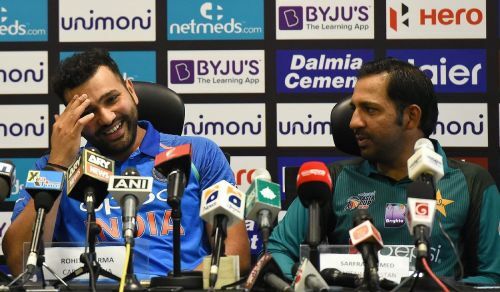 Minutes before the formal press conference started, all the captains had a casual chat with one another with Rohit Sharma, Sarfaraz Ahmed, and Mashrafe Mortaza involving in some friendly conversation that set out to be quite funny and controversial. Rohit suggests Mortaza, "Aapko control karna chahiye in sab ko"
The language of the discussion was Hindi as every one of Rohit, Sarfaraz, and Mortaza are well acquainted with the language. The talk started with recent controversial stuff that had clubbed the Bangladeshi cricket some time back. The premise of the discussion was Sabbir Rahman who got a 6-month long suspension by the Bangladesh Cricket Board. The ban came as disciplinary action by BCB after Sabbir abused a fan on Social Media. Sabbir had just finished serving a ban for physically assaulting a fan during a first-class match last December. Mortaza notified Rohit and Sarfaraz about the whole story and how it got into the form of controversy. Sarfaraz took the whole conversation to new a level while asking whether Sabbir doesn’t want to get married since that is what appeared to him from the outside. In the meantime, Rohit suggested Mortaza, "Aapko control karna chahiye in sab ko." (You should control your players and take care of them). Lastly, Mortaza notified Rohit about how Sabbir purportedly beat a child in last December to which Rohit replied, "Maara? Pagal hai kya?" (He abused? Is he gone mad?). The funny conversation ended here as the formal press meet was about to start. Rohit says, "It is always exciting to play Pakistan"
With the cameras rolling on, the captains were throw in some questions with Rohit being asked about the India-Pakistan tie. Answering the question Rohit said, “I am sure everyone is looking forward to it, but we will just focus on the match at hand. It is always exciting to play Pakistan, they have been great lately and have played very good cricket." India will be starting their campaign on the 18th of September against Hong Kong. India will be playing their league matches back to back with their second league match (against Pakistan) scheduled on 19th of September.